I am very excited to show you my wedding shoes which arrived in the mail last week; I’ve never displayed anything wedding related on my blog before so I thought it was about time I gave you a preview. All credit goes to my mum for finding these shoes. She even paid for them which I greatly appreciate. One afternoon, a number of months ago, I was watching the shopping channel with my mum and these incredible sparkly shoes were for sale. We both admired the shoes; I thought they were perfect and would fit in so well with the theme of my wedding. But since they were over $200 and the wedding was still almost a year away at that point, I never seriously considered buying them. I actually even forgot about these beautiful shoes in the following months. Then, very recently, my mum informed me that the shoes were on sale; TVSN was having a major clearance and they were reduced to $45. Can you believe $45? That’s insane! I went on the TVSN website and was surprised to see that my size was the only size left (these shoes and I were meant to be together, right?). The incredible price, coupled with the flexible return options meant I had nothing to lose in ordering them. After placing my order the shoes were sold out; I literally purchased the last pair. Within a few days my shoes had arrived and they were stunning. They fit well and are so pretty and sparkly. They are exactly what I wanted and I couldn’t be happier with them. What a bargain! They fit the wedding theme; crystals and sparkles are a major element and my bridesmaid’s shoes, which are black, have the same crystals on the heel. I had thought about purchasing brightly coloured wedding shoes but I came to the conclusion that my wedding is one of the only occassions where I can get away with shoes like this! Thank you so much for your comments on my last post. I really appreciate your kind and helpful words. It means a lot having so many wonderful friends that understand. I actually feel so much better right now. On Saturday Rydog and I went to view some potential rental properties. We are not planning to move out for a few more months but I want to be prepared and have a clear idea of what is available. You can never be too organised with this sort of thing, right? The rental market is fairly dismal; everything is so small and in less than desirable condition. I’m going to find it hard to adjust because I am used to living in lovely spacious homes. I don’t understand why people don’t take care of rental properties; sure tenants don’t own the place but if I were a tenant I’d still like to maintain the property to a high standard so it was nice while I was living there. I actually wish I’d viewed rental properties four years ago; the reality of the situation probably would have motivated me to save for all the years leading up to now. However, Saturday was a positive experience in many ways. I genuinely enjoyed looking around; I have always had an interest in real estate and I find it fun looking inside various apartment complexes and imagining what life might be like there. It is still early days; I have to remind myself of the possibility that something better might come up. Oh wow those shoes are gorgeous! hello!!! I love everything in your blog… Please come visit my blog and if you like it let me know if you want us to follow each other…. oh dear, these shoes are pure lust!!! omgg these are absolutely stunning!!!! love love love them! [REPLY]ooh i've got to see a pic of Julliette one day hun! Wow they are gorgeous. So cool to be able to find exactly what u wanted plus on sale! Those shoes are stunning! They're such a perfect pair for a wedding. Beautiful shoes! You are right, they were meant to be for you! Good luck hunting a place to live, I know it can be so insane! The shoes are incredible! I love the sparkle-arkle so very much! I think that when you guys are ready to move, the right thing will come up. These wedding shoes are PERFECT. I am so happy and excited for you. Can't wait to see the dress that goes with these awesome shoes. What a great glitz and glam item of the week! I love these heels. Amazing shoes, nice blog, follow each other? This is a great look! So pretty! I am such a fan of your new shoes! 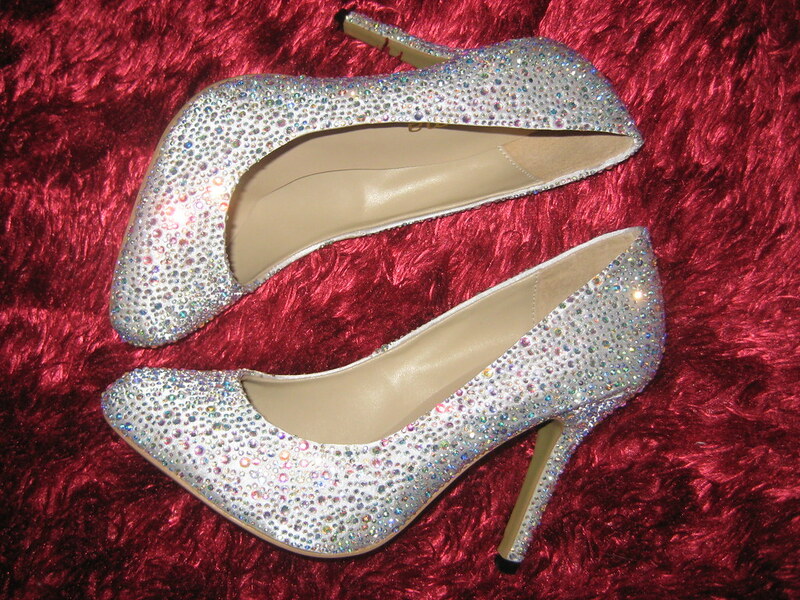 They're lovely and I think you'd be able to wear them a lot even after the wedding, they're so fun and sparkly! OH MY!!! These are gorgeous shoes!!!!!!! Tia, this are BEAUTIFUL. Like, no words. Oh these are so stunning. 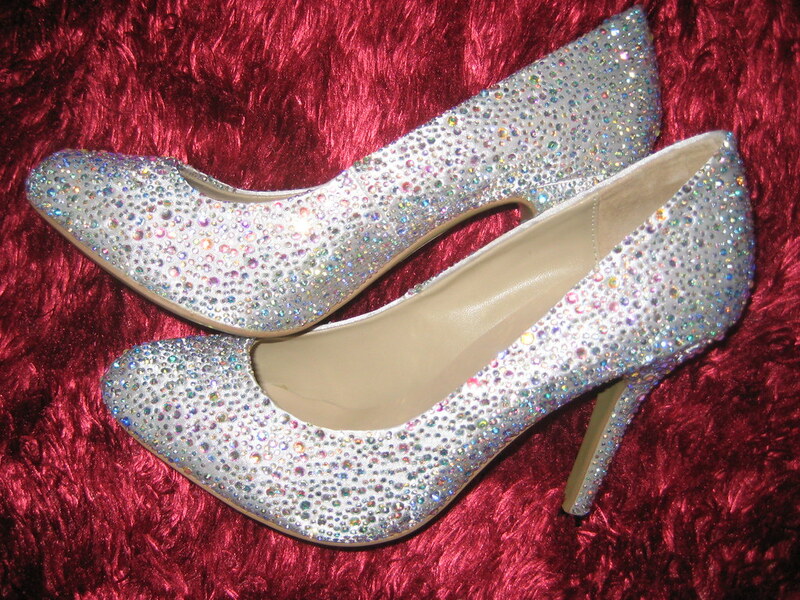 Cinderella shoes! Your wedding shoes are so awesome! They'll be perfect. I love how sparkly they are. I'm definitely a firm believer that wedding shoes should be fun and these definitely are! those shoes are so glamurous! wow!